measure, calling it a "blot"
BUCHAREST, Rumania "No conversions to that opportunity. children a chance to emigrate. ZTZTvZ 400,000 who survived Hitler's horrors. less freely, and many Rumanians are ready to i oetmeed on Page *. The theme of the conference is. effort on U.S. support for Israel. your place at this conference now. President Chaim Herzog. T***J ^iTS/0"
who as Israels UN^- SjfiSiA*Stt !? New Threats to Old Ties". take part in the effort. remote, that it would JW' Wlth,no"^ *or **! may qualify for the position. rnnloeiuei a loaawm Freoiem AH Dietary is*. Assembly at the Kennedy Center. need fraternity with other Jews. "Jewish life was never monolithic. dient in motivating Jews to want . 820. through the end of October. any signs of organised Jewish life. others all within the last year. This is the test of their credibility. this national sffvrt: Robert A.
Geimr, Coral Springs; Alfonso A.
roasted to bring out its nut like flavor. It's versatile. saeat or vegetables, as a hot breakfast cereal. persisted in its terrorist assaults. mander of Arafat's "Force 17,"
both countries daim they support. ing any sincere desire for peace. set is a negative one. diplomatic relations with Israel in 1967.
favored tariff status for imports from Rumania. gone to Israel. "They didn't go to Philadelphia,"
Jews prefer the United States over Israel. made anti-Zionism an article of faith. where all publishing is official. tervention by Mr. Ceauaeacu to m"
Talmud-Torah schools in 28 communitieslearr. for an American visitor, the Rev. Billy Graham. ms income and what is necessary," said Dr.
Rumania. They get meat four times a week." temple, before the autumn holiday season ends. ed Jewish populations of Eastern Europe. uoceSi according to Max E.
Kushel, chairpersons of the series. i in the series Monday, Jan.
Israeli people appreciate the friendship of the people of the U.S.
killed and seven other people were injured. especially for Hillel Academic Associstes. 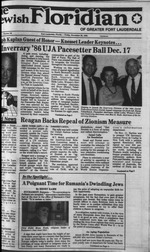 League of B'nai B'rith reported. mitment of American Jews to the State of Israel is well known,"
chase of Israel Bonds is much appreciated." TUBS. DEC. 10 7:55 P.M.
law Hetty proudly looks on. Award was shared by Julius. Monday, December 9, 5 p.m.-7 p.m.
Candle lighting ceremony at 6:30 p.m.
Kindle the Third Light together! of Hope Chapter. B'nai B'rith. fabrics to keep idle hands busy. corning of happiness to the participants of the Jcwxl?. and others. Please call Sandra Friedland, 797-0331. t/J. FOR FAR LESS THAN YOU EXPECT!!! vis the second half of last year. tion as "Fraud Capitol of the World." who are dedicated to helping to prevent and fight crime. with 15.5 million during the same 1984 period. and rolls, try August Bro6. Am. 7205 Royal Palm Blvd..
Harry Hirsch. and his wife Ann. Jewtsh Federation of Greater Fort Usskedms^^SifZ? ideas relating to the cultural field. We Must Finish the Job Now! the newly formed Hall of Fame. neighbor and friend of Israel." with special awards. Joel H.
Bernard Gross, Lloyd Hurst, Dr.
[Meeting. 9:30 a.m. At Federation. tion. 8 p.m. Lauderdale West Auditorium. Dec. 17 Inverrary Pacesetter Ball. 6:30 p.m. Inverrary Country Club. Dec. 19 Woodlands Division Dinner. I. 4 p.m. Cocktail Party. Clubhouse. Departs. Through Jan. 3, 1986.
low contribution rapports all of these agencies and programs. Its dedicated vice rector. Dr.
M IMHII (MM** MK . as high as 50 to 60 percent. and its now about 40 pecent. sanctuary from wall to wall. Israelita" now in its 62nd year. It's editor for the past 18 years. part of President Raul Alfonsin. Israel to prevent "dropping out"
representative body of Polish Jewry. He has visited Israel twice. Jewry was held on November 19.
the issue was "close" to his heart. and complaints, but we can do it." IOI KM VS m HI Ml MBI R! Beth Hillel: 8 p.m. UJA Sabbath. Center. 9101 NW 57 St.
Country Club. 7801 NW 80 Ave.
p.m. Board of Directors meeting. Dec. 2-4 Key West Trip. troduced by Sen. Carl Levin (D..
Federal. 5518 W. Oakland Pk. Chapter: 10 a.m. Board meeting. and card party. At Temple. Regional. 160 NW 170 St.. NMB. 1451 N. Dixie Hwy. 564-5184.
of United Synagogue of America. nels; Dr. Mel GuUman, a friend of Dr. Nomek..
sanctities the name of the Lord. on Tuesday Dec. 10 at 1:16 p.m.
Berger. The public is invited. JERUSALEM Slowly but surely, with great perseverance. tion in the country has improved. parts of Judaea and Samaria, and the Gaza Strip. basic spoken Hebrew through "Everyday Hebrew for Tourists,"
yourself kit produced by Everyman's University of Israel. service at Temple Beth Am. celebrated at the Saturday Nov.
30 service at Temple Beth Torah. Galia, son of Wendy and Dr.
tober "Cooking tnth the Great Chefs of Florida series. ceremony on Saturday Nov. 30.
gyqyV17* acsui of coconit cam..
tuou mi am mtsusi. m aoyy p*. bw . ml. MO pa Bakai AftartN. BM.. D-rriatd It, 33441 aarrW 8ay U>rt Frag fc. P Saturday 45a.., Caartaa B Friar. " - --V B4S LS, I pa Caaaar Paal Maart. TOUNG tBBABL OF OKKBFDJLO BCACM <4M \~\. 1M0 W.
2f*/"*W. H* F-; ll.il. a*. sule or tablet form msy be toxic. of the stomach and esophagus. totaling more than $10 million. are important to us...And they are important to you. ate the comforts of business class. of a company to afford them either. of you is sitting on your lap. Of course you'll alscTbe treated to a lot of oth^Ttf^^to rT^l- ^r^x^. And let us know you mean business.